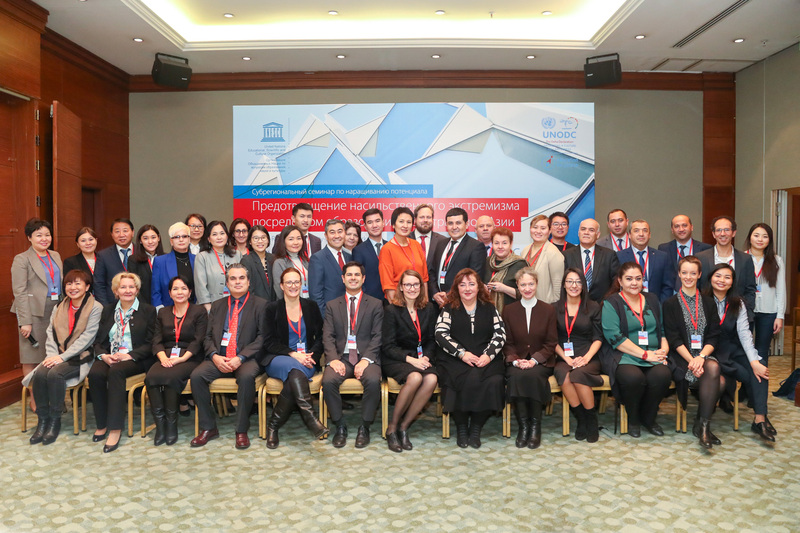 The UNESCO Almaty Cluster Office in Kazakhstan, Kyrgyzstan, Tajikistan and Uzbekistan and UNESCO Headquarters, in collaboration with the United Nations Office on Drugs and Crime (UNODC), held a Sub-regional workshop on the prevention of violent extremism through education on 13-15 November in Almaty. UNESCO’s approach to preventing violent extremism through education is related to its work on Global Citizenship Education (GСED). Based on its long-standing commitment to peace and human rights education, GCED strives to foster respect for all, create a sense of belonging to humanity and help learners become responsible and active citizens. Thus, the GCED creates conditions for strengthening learners' commitment to renouncing violence and promoting peace and creating conditions for protection from hatred, discrimination and violent extremism. The workshop was organized within the framework of the partnership of UNESCO and UNODC on “Global Citizenship Education for the Rule of Law: Doing the Right Thing”. The purpose of the workshop was to strengthen the capacity of education stakeholders to implement educational measures and approaches that help to prevent violent extremism in an effective and appropriate manner. More specifically, the workshop provided a common discussion platform for a clearer understanding of the issues of violent extremism in the Central Asian region, and allowed to discuss new tools and innovative approaches. Workshop participants also identified follow-up activities to be implemented with the Education Sector in view of supporting national prevention efforts. During the workshop, participants visited the Nazarbayev Intellectual School and Almaty State College of Tourism and Hospitality Industry and observed classes on Global Citizenship Education and values. The workshop brought together education stakeholders from all over Central Asia, including representatives from the ministries of education and community development, universities and research institutes, as well as youth organizations and civil society. International experts, UNODC, UNESCO as well as other UN agencies and international organizations also took part in the event. More information on UNESCO’s work in the Prevention of Violent Extremism through Education.